Space Flight in the Xcor Lynx Spacecraft. Life changing. The Age of Space Flights is about to begin! We are very excited: The age of Space flights will start very soon. After we have been waiting for years, the two most advanced designs are not far from taking off: The first is very well known, thanks to the huge financial power of the Virgin group and the charismatic Virgin founder Richard Branson. The second one started years later, but thanks to its simple design and a highly experienced crew, it is now neck-and-neck with the Virgin Galactic project. 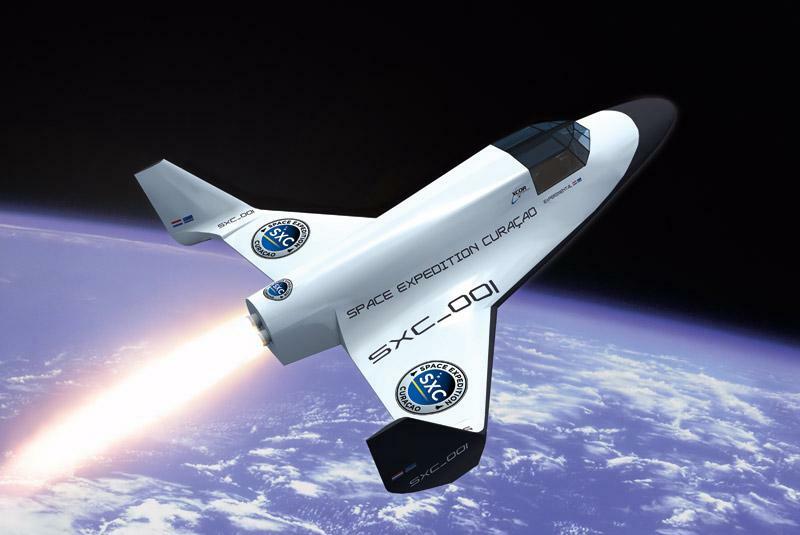 We are excited to announce the Xcor Lynx space vehicle will have its roll out in spring 2015. The Xcor Lynx spacecraft, built by Xcor Aerospace. Below you can find the Xcor Lynx Space Flight animation video. The first passenger flights are probably as early as 2014, after an extensive test program. The two projects seem to be the successful ones and they’ll take the age of human space flight to the next step. Suborbital space tourism is very close! One of the reasons we have chosen to partner with the Xcor Lynx project and not with Virgin Galactic is the feeling you’ll experience as space flight passenger. It is much more like sitting in a fighter jet, as you sit next to the pilot, like in the Hawker Hunter. So you are much more like a co-pilot, while the Virgin Galactic passenger is sitting in the back, more like a bus passenger. The main advantage of the Virgin Space Flight was the larger craft, that was offered for floating in weightlessness. It turned out that passengers are not allowed to leave their seats, so this advantage has gone. The second advantage was the increased altitude of 100km (around 330,000ft), that Virgin Galactic achieves. 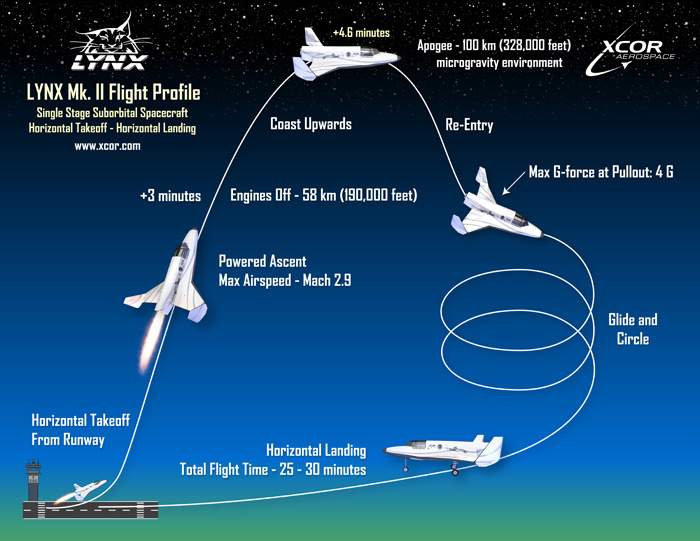 The Xcor Lynx Mark-I reaches only 61km or 38miles/200,000ft. However, this is enough for a great experience and a unique view. The main difference will be that passengers do not cross the Karman line at 100km, so they are not Astronauts by definition. Xcor Aerospace already develops the Mark-II. This is the same Lynx spacecraft, the only difference is that fuselage is larger and built with composite material. The Lynx Mark-II will rise to a maximum altitude of 103km or 338,000ft. It will enter service a bit later, but is already bookable. So, if we compare the two designs again: The Xcor Lynx is far less complex, which is an advantage: Increased safety, it can fire the rockets again if necessary, and the cost is only USD 150,000.00 compared to Virgin Galactics USD 200,000. Also, the Lynx space flight experience is very personal: You have your pilot who is there only for you, while you will share the spacecraft with 5 more passengers at Virgin Galactic. The figures of the Xcor Lynx Space Flight vehicle are truly impressive. This small rocket-powered craft will break the sound barrier and fly supersonic 58 seconds after taking off. Immediately after taking off you’ll climb in a 75° angle with a constant push of 3Gs. The maximum speed you’ll achieve during your flight to space is Mach 2.9 or 3550km/h (2200mph). After 3 minutes of rocket-like acceleration, the Lynx spacecraft reaches 58km and switches off the engine. It still has enough speed to reach the maximum of 103km or 338,000ft about 1.5 minutes after stopping the rocket engine. The view you have up there is stunning. An experience you’ll never forget. Astronauts say it is that view back to earth that changes their lives. The Lynx flights will start in 2014 . First locations are Curacao and Mojave desert (USA). Get your space flight ticket now to be among the first! Please be as specific as possible so we can process your jet flight booking or inquiry in the best possible way. I agree to be contacted by telephone. I agree to be contacted by e-mail. We absolutely guarantee your data privacy and will never, under any circumstances, share your contact information unless needed for arranging the jet flight. Yes, I'd like to be kept up-to-date and agree to receive 4-6 newsletters per year. By signing up to our newsletter, you make sure to be the first to know about new flying possibilities, special events and promotions related to fighter jet flights. Subscription is completely voluntary and can be canceled at all times. FlyFighterJet.com allows you to fly in a real fighter jet - even if you're not a pilot! Our experienced instructors will take you for a jet ride. You're just a few clicks away from the Adventure of your Life! Use our SSL-Secured Contact Form to submit your inquiry over a secure connection. If you like our jet fighter experiences, please rate us. Thanks! "The MiG-29 flight was the perfect gift for my husband!" - Sue, housewife from the UK.